A young Argentinian boy broke free of his mother’s clutches to play with Pope Francis during a Vatican audience Wednesday, much to the pontiff’s delight. “This boy cannot speak, he is mute,” Francis told those gathered for his weekly general audience, after the boy’s mother apologised and explained to the pope that her son was autistic, Italian media reported. “But he knows how to communicate, how to express himself,” the Argentine pope said. “And more than that: he is free. Free in an unruly way, but free”. The boy tugged on the gloved hand of a Swiss Guard and played behind Francis’s chair. “Give me a kiss,” the pontiff said, as the boy’s mother rushed on stage to try and catch him, before Francis told her to let him be. “We should all ask ourselves, am I as free in the face of God? We should all be as free before God as a child before his father”. “Let us ask for the grace for this child to speak,” he said, as the 7,000 or so faithful present burst into applause. 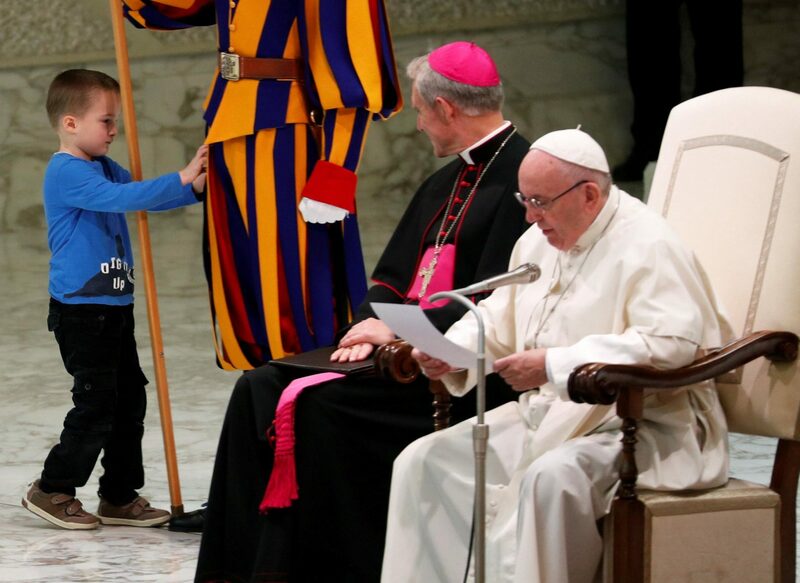 The Prefect of the Pontifical Household, Georg Gaenswein, who was sitting next to the pope, turned to him and joked that the boy “is Argentinian, he’s unruly”.